> LineBallTennis - Clapham Common have written "assessor's report" for two its junior players trying for The Duke of Edinburgh's Award. The juniors in question are Pablo and Olivia (pictured). They chose racquet sports tennis for their "physical" activity section of their Awards. If other local school children need to complete their "physical" section LBT will be happy to train and assess. (ks 19/6/18). 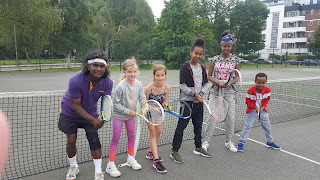 > Principal tennis-coach Krishna of LineBallTennis - Clapham Common is happy to announce extended full-day sessions between 8.30am to 5 pm of "Strictly Come Junior Tennis Camp". 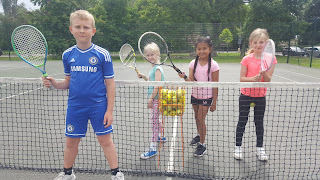 By local demand, extended morning and/or afternoon sessions are £8/£16 on top of usual full-day of £20, will start this Spring half-term on 30th May Wednesday. LBT's Krishna understands this provide a valuable timing-facilty for working parents wishing to drop-off their young ones before starting work. LBT expects to continue to school Summer holidays camp too, depending on demand. 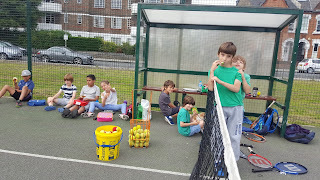 > LineBallTennis - Clapham Common have a moment to blog some local tennis news and pictures. 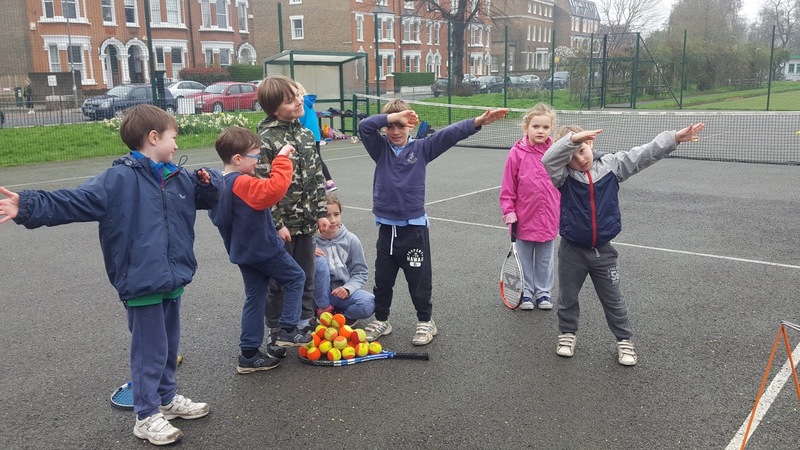 These are from LBT's on-going tennis coaching and Easter holidays Junior Tennis Camp, which ended two week ago. 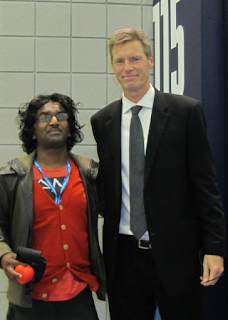 Also, following and completing Krishna's activism towards Local Council Elections. Spring February 2018 "Strictly Come Junior Tennis Campers" with LineBallTennis camera by K K Siva(Yours truly). > The background to the over-crowding at Clapham Common tennis courts is a single coach who hires additional external tennis coaches to run a tennis coaching business (when there are sufficent local LTA clubs set-up for that specific purpose). These coaches then get licensed by Lambeth and both contract for this coach or independently. 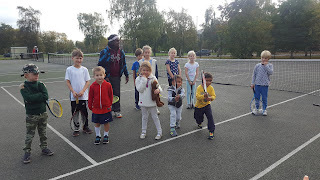 > Collecting wonderful pictures of our tennis juniors (and adults) when they build ball-pyramid gives an opportunity to showcase them and their joy in participation with LBT principal, Krishna. Below are Mark and Mitya who have been dubbed "Butch Cassidy and the Sundance Kid" after the charachters of famous old Western film (KS 04-May-18). 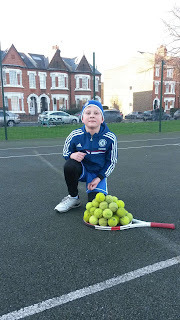 > LineBallTennis of Clapham Common take this freak wintry snow blizzard weekend, to update our local tennis news. The freak weather has been headlined as euphemistically as "Mini Beast From The East". Dubbed "Mini" this time because we had a week long of this Siberian tundra weather pattern in the first week of March; due to irregular rotation of the jet-stream above Scandinavia which gathered the weather-front from Siberian tundra. The dumbing-down mainstream media called it the "The Beast From The East", instead of what it really is "CLIMATE CHANGE". 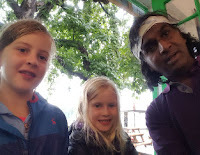 > Those chance visitors to our LBT webpages will know that the principal tennis coach Krishna is an activist these days (The Weatherman Underground) - a far cry from his trading floor investment broking and management past! 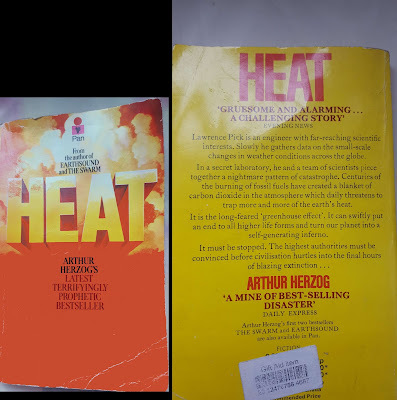 And that he propounds the not-too-difficult-to-comprehend and evidence-based ecological science that man-made climate-change is probable and actual. So we like to believe that President Donald Trump is not naive to the #climatechange science but his methods are designed to circumvent widespread economic panic. Ask Krishna or follow his tweets (@LineBallTennis) if you'd like to know more about that bizarre logic attributed to Trump. 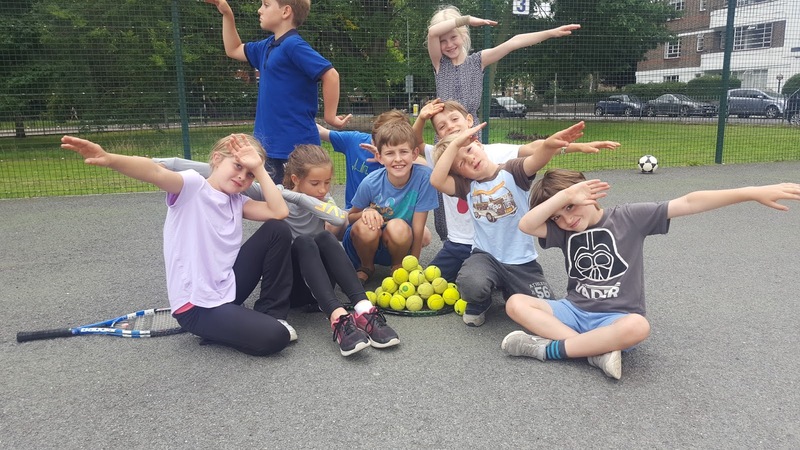 > On more local tennis news and less weather and activism, LineBallTennis have been taking bookings for "Strictly Come Tennis Camps": the next one being Easter school holidays starting 26-March, right through to 17th April. Spot the "Tennis-Ball-Pyramid Builders" of Clapham Common and their careful creations! > Haapppppy Neewww Yeearrrrr To Yaaa! Also, hoping you had festive holidays in safety. Now to get motoring into the New Year, and lose any excess fat gained from the seasonal revelries. I've been called out to play tennis yesterday 10th January by a local adult; and being informed he had symptoms of "fatty liver" diagnosed. To which the self-serving remedy or cure is to cut-back on drinking and more exercise. 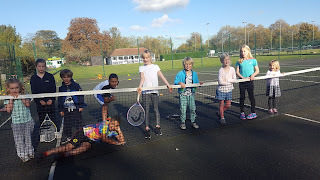 >Now signing-up for Spring Juniors Tennis Camp: For the 'uber' organised parents out there, I am giving notice of my Tennis Camp for spring expected to run from 12th to 23rd February. Scroll to the bottom of this page for details of value pricing, and about the limited and reserved places. Psst! pass it on. 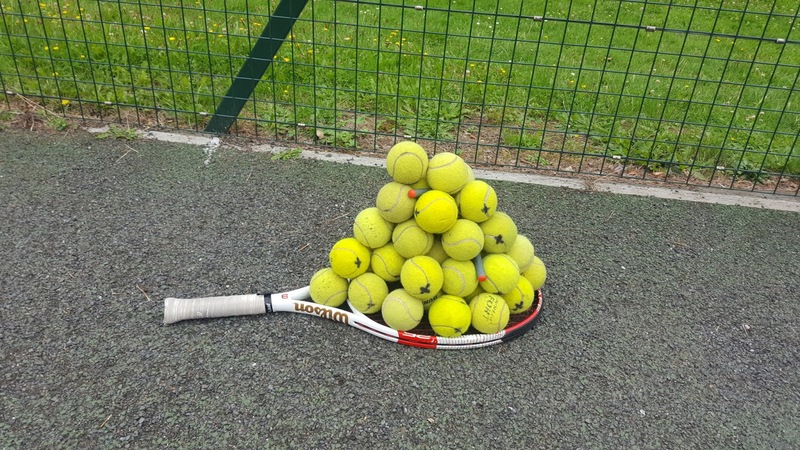 > Also a reminder, that LineBallTennis have started an "Adult Drop-In Tennis Fridays" from 8pm. 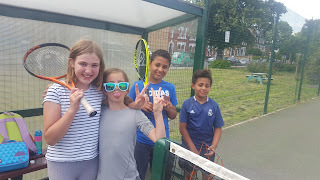 A chance to play doubles, practice tennis drills and perhaps socialise afterwards at The Nightingale pub is all for the inaugural princely sum of £4 for the hour. The only requisite other than your presence is to notify me "Krishna" in advance of your attendance. 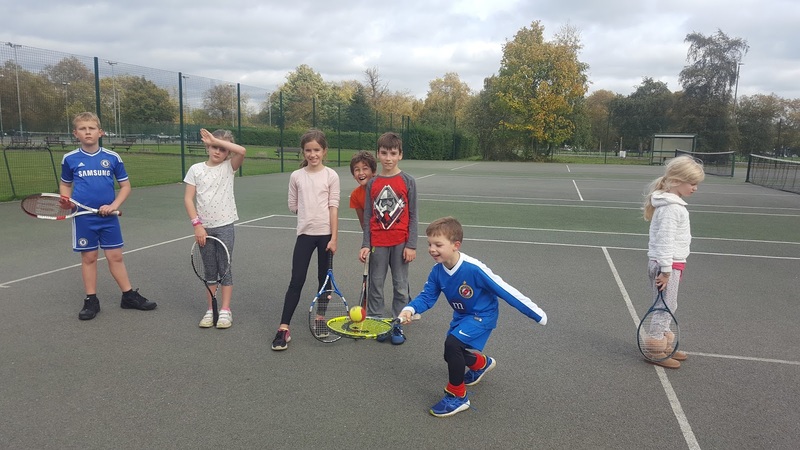 This adult scheme follows the somewhat successful Junior Tennis Drop-In earlier in the evening - which re-starts in the Spring. Captions to follow. We wanted to remind ourselves of lovely Autumn sunshine as we head into the cold darker days perhaps, of the festive season. 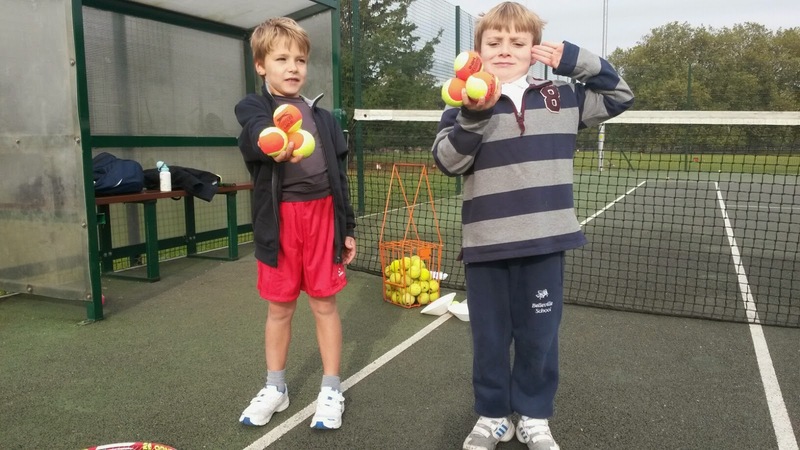 Oct.23rd Monday PM: Autumn Junior Tennis Camp kick-starters Stars Mitya & Daniel - Flipping bottles! Oct 23rd Monday PM: The Brands - #Dunlop. #Slazenger, #Adidas #ClaphamCommon, #Tennis. 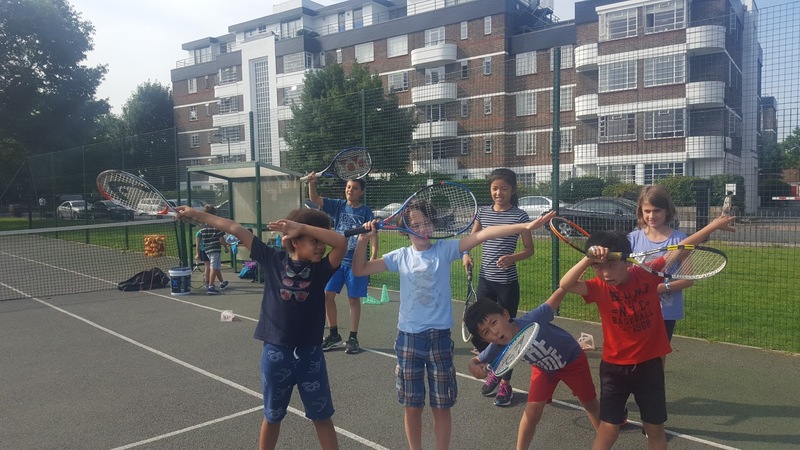 > It may seems like summer was so long ago (just look at the pictures below to remind one); yet LineBallTennis - Clapham Common are looking forward to October Junior Tennis Autumn Camp. Please see details at foot of this page. 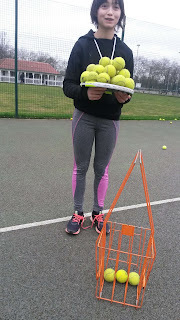 > Prices & Practices of Clapham Common Tennis Coaches: LineBallTennis serving Clapham Common is charging the best value tennis service without doubt; with less academic and more practical knowledge and experience. 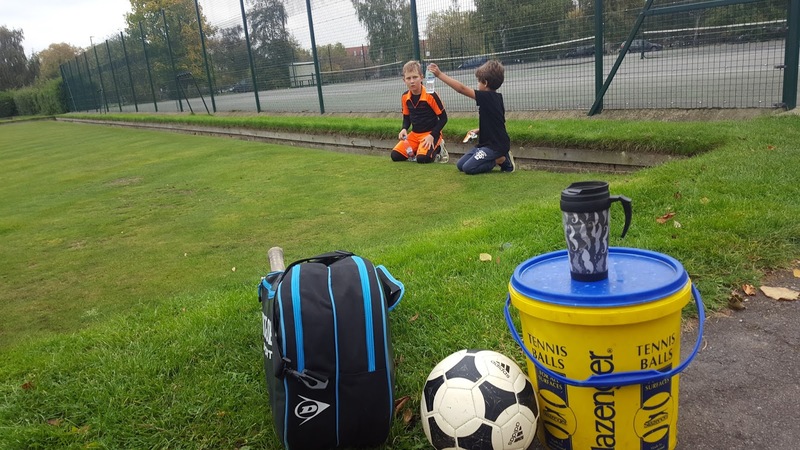 We have decided as a forthcoming Local Tennis News to compare coaching practices and prices charged by the excessive number of coaches. 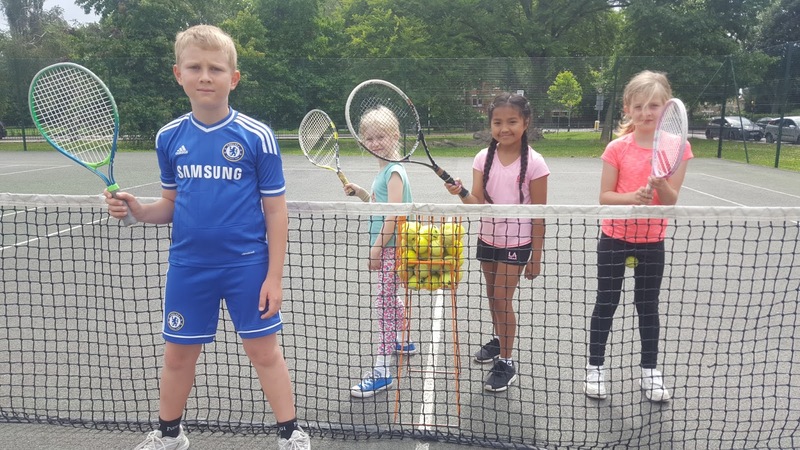 This critical price and service comparison is serving as local public information for parents and users; as well as considering "All Star Tennis" service delivered at rival Wandsworth Common, across the way. 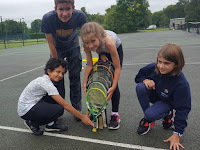 Sept. 5th Tues AM: Last day of LineBallTennis Summer Camp for junior tennis. Mood was content / happy showing of a ball-pyramid and doing the 'Dab'. Our stars were Lara, Kaia, Cyprien, Toby, Felix - hidden, Constance,Bella, Valerian & Spike. Sept. 4th Mon. PM: The happy campers break-out for lunch - Kaia literally at the entrance to the courts. What a fiasco that caused with lost money! Also, who has swapped his racquet with baby Bamboo in the background? 1st Sept.Fri PM: Kaia action photo: early forehand preparation [Photo by Cyprien]. NEW COLLECTION OF KAIA BY CYPRIEN TO FOLLOW ON LINEBALLTENNIS. 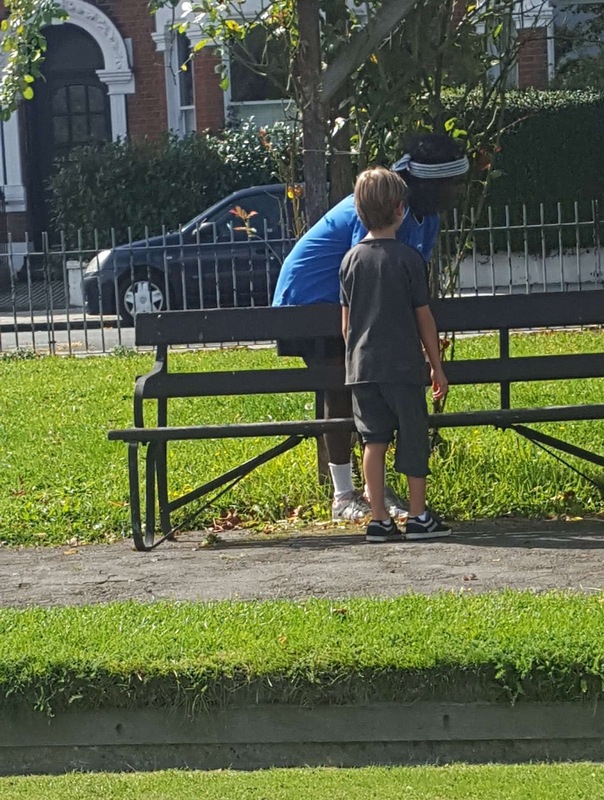 1st Sept Fri AM: Guest Bambo with Kaia in the trenches of the Clapham Common Bowling Green [Photo by Cyprien]. 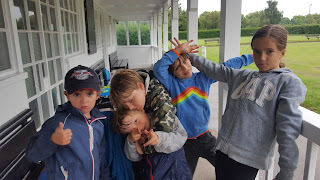 Aug.30th Weds: Freddy, Valerian, Cyprien Constance & Kaia - Really wet day, we took shlter in Bowling Green pavillion. Aug.25th Fri AM: same crew. Aug.23rd Weds AM: Same crew! 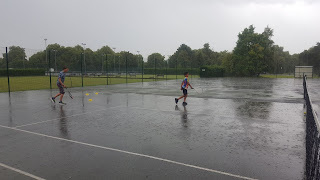 Aug.18th Fri PM:Harrison & Ali Pavillion-End Court 3 - In the Rain! Aug.18th Fri PM: Omar & Kaia Opposite-end Court 3 - In The Rain! 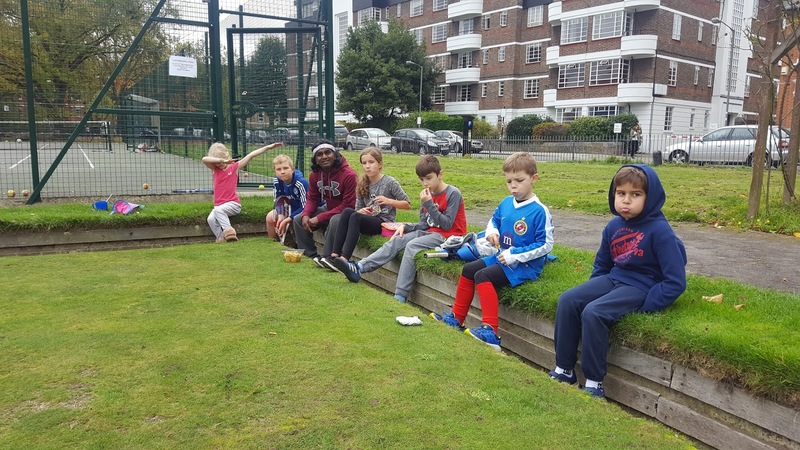 Aug.18th Fri AM: Ali, Kaia, Evelyn, Adam, Jamie, Luca, Costa, Daniel & Omar - at break time. Aug.16th Weds. AM: Ali, Felix, Omar, Kaia, Daniel, Spike, Kosta & Luca - at break time. Aug.14th Mon. AM: Eliza, Kaia, Omar & Ali - Kool Kaia & The Gang! Aug. 8th Tues am: Mitya with 19" racquet!!! Bella with 21", Karoline with 25" and Lara with 25". Aug.7th Mon. 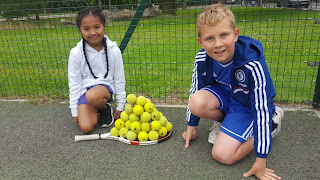 am: Mitya's super ball-pyramid! > LineBallTennis Is More Than Tennis Cool! 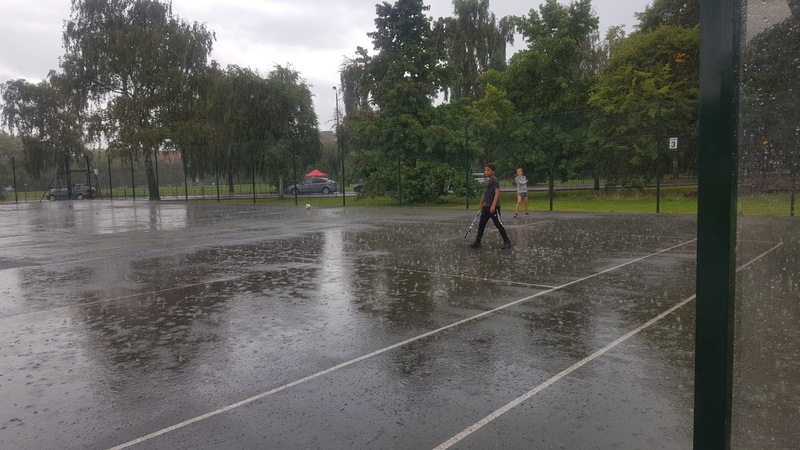 - Third week into school summer holidays, and midweek Wednesday 9th August, is again wet - all day! 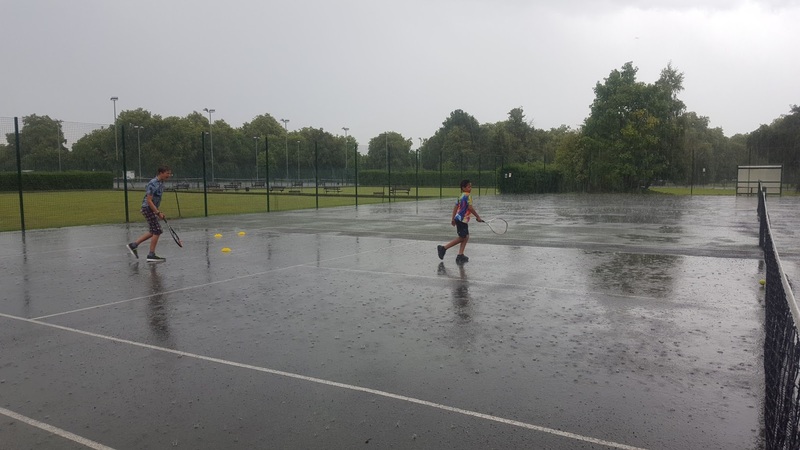 After cancelling and refunding his juniors of his Summer Tennis Camp, LineBallTennis - Clapham Common local coach Krishna, asked a sympathetic passer-by if it is just a wet "British summer" or is it "climate change" as well. The answer was "both". Krishna is believer in man-made thermal pollution WILL change climate and environment. As if to prove it, he came across this book "Heat" by Arthur Herzog, one of the earliest fiction on climate-change in disaster scenario. Is it fiction? 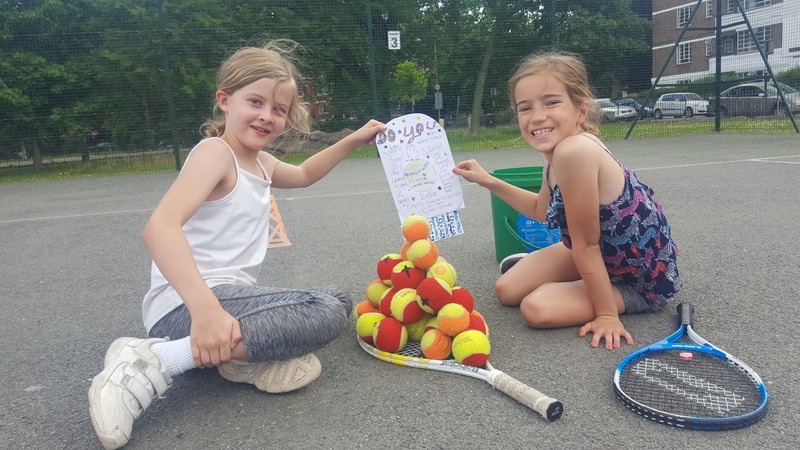 Aug 2nd Wednesday: George at Camp With LineBall's "SwingBall"
Aug 1st Tuesday: Lara & Kaia Holding Their Overnight Designed Poster For LineBallTennis & Having Built The Ball-Pyramid - Wow! July 31st Monday: Cyprien Joins LineBallTennis Poster Girls Kaia & Lara, with Ball-Pyramid. 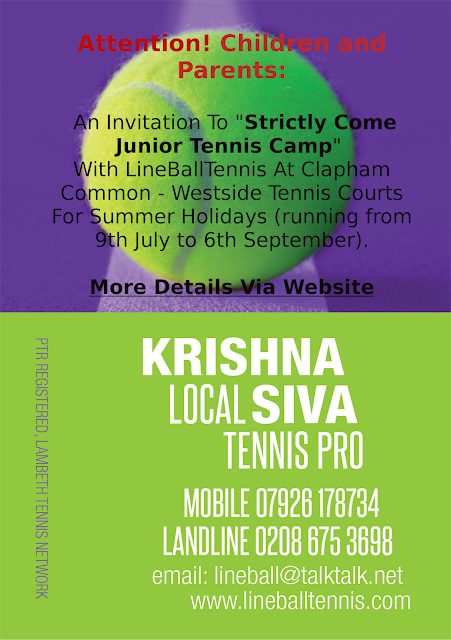 LineBallTennis - Clapham Common, run by Krishna, is selecting up to 8-10 junior tennis players to start Summer Camp from 24th July. If you would like to join this select group, please contact Krishna the "local coach" directly. More details at the foot of this web page. 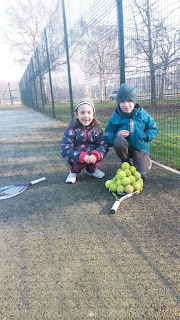 >Tennis-Ball-Pyramid Builders: The required patience and organising to build a pyramid of tennis balls while simply collecting and gathering the balls we feel is noteworthy. 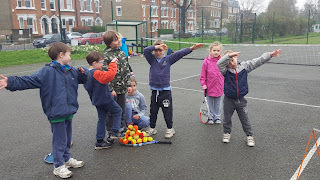 Watch this space for photo's of these junior tennis stars of LineBallTennis - Clapham Common. > Its Not About The Quantity Its The Quality, Stupid! That was the way of things for the end-May half-tem camp that LineBallTennis - Clapham organised impromptu. We, or just Krishna the LBT principal, had just three junior players as camp starters between Wednesday and Friday from 10-1pm - regular star, Kaia, and brother and sister duo Oliver and Ava. While another "overcrowded" camp with 30+ toddlers and mixed-ages were alternating on two courts and green space behind court. More on this on our blog piece exposing scandalous global and local scams. Regular star of LineBallTennis - Clapham Common camps, Kaia with pyramid-balls! The full camp course attendant Kaia (shown above), aged 9, said she really got a lot out of the focused pro's attention (Semi-western forehand, serving from scratch-back position and devising a circuit). New comers Oliver and Ava, could only stay the first hour of three. 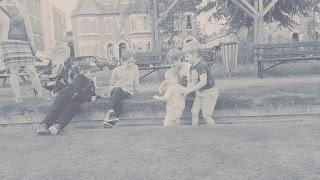 They'd arranged swimming for afterwards, not knowing about junior half-term camp - which was little publicized and impromptu. Oliver who stayed behind from attending swimming on last day of camp, due to an ear infection, has started a rivalry with Kaia. 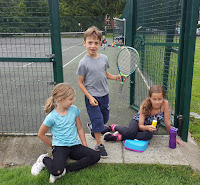 The younger Kaia overcame stronger Oliver 3-1 in games, with latter talking of "pressure", but coolly handling "McEnroesque" outburst of former. Epic encounter with long rallies on a near-full court! 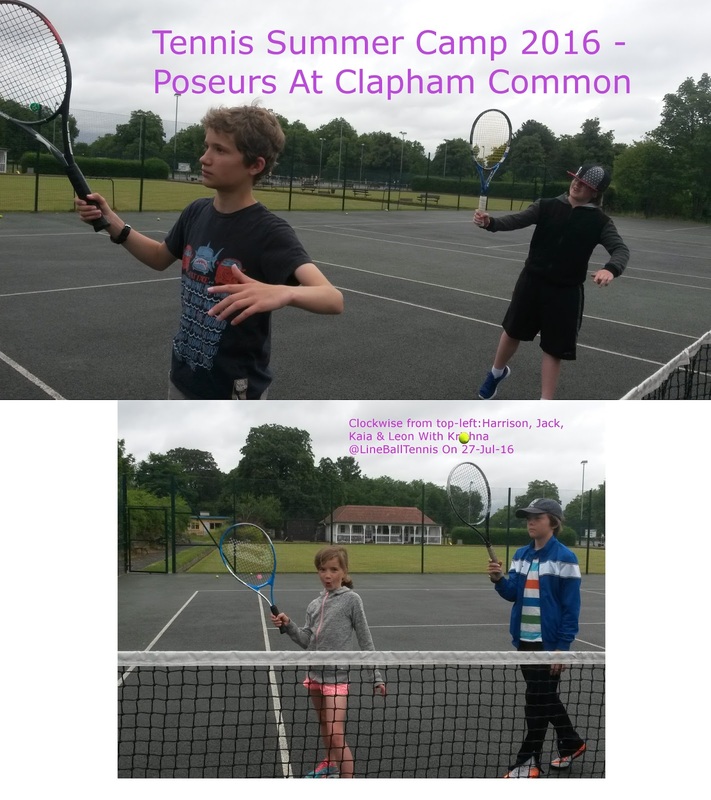 Former British No.1 Tennis Player & Local LineBallTennis - Clapham Pro. 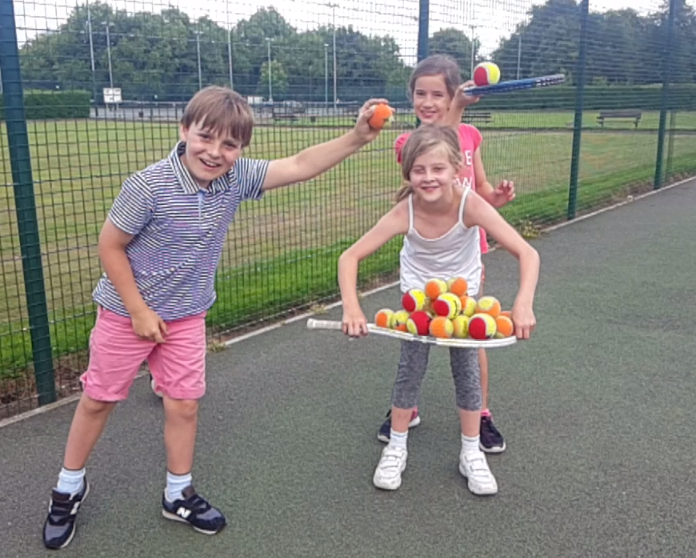 > Here below is a video of LineBallTennis - Clapham Common Krishna serving: Can anyone spot the obvious mistake he is making in his service technique? We occasionally use slow-motion video analysis for spotting mistakes. 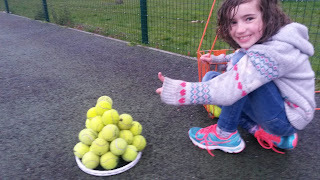 Juliana Collecting Balls In A Pyramid Fashion! Vera & Mark Collecting Pyramid-Balls. Mitya - The Builder of Super Pyramid-Balls! 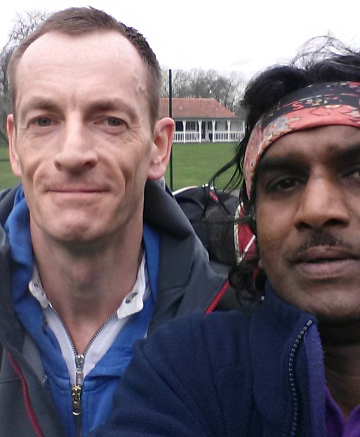 > LineBallTennis - Clapham Common Krishna was visiting local tennis courts near LOUTH ROAD, Grimsby, Lincolnshire in Feb/Mar'17: and IS keen to get in touch with coaches Gemima and Mark, especially SUPER SHOT player JULIE! An exchange programme was planned with players keen to get clean 'northern' air and a spot of tennis. Please DO get in touch via our 'Contacts' page as your details have been lost but never forgotten. > Following The Muted Success Of LBT's Summer Camps (for Juniors aged 5-14 at Clapham Common from Monday 11th July to Friday 2nd September), Krishna, its overseer, is promoting "propa" tennis camp for school half-term holidays in the autumn and right through winter for the hardy tennis players - See Details at Bottom of This Page. 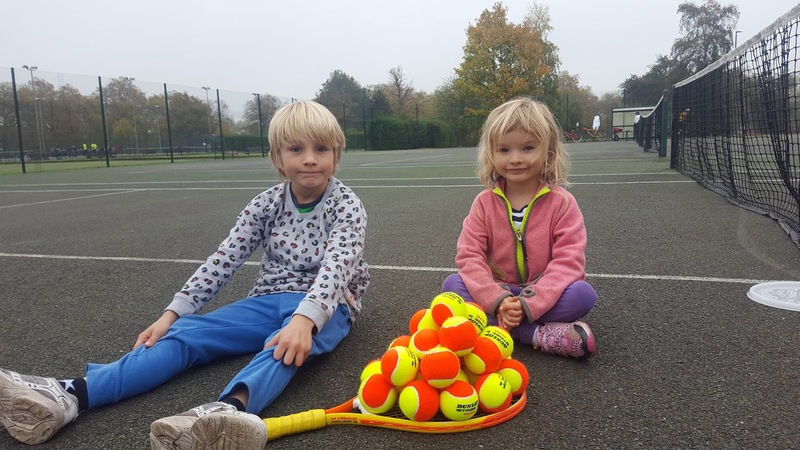 > One of our Clapham Common residents and spouse and father of LBT tennis players has inspired us to uniquely market the Gift Business Card Scheme. 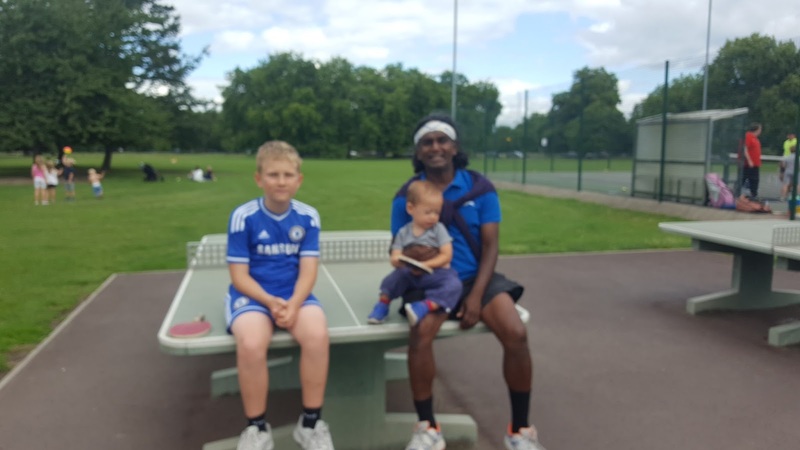 Basically Sukdev wanted to purchase a block of tennis lessons for his wife Mandish's birthday (back in February this year - we've been busy!). 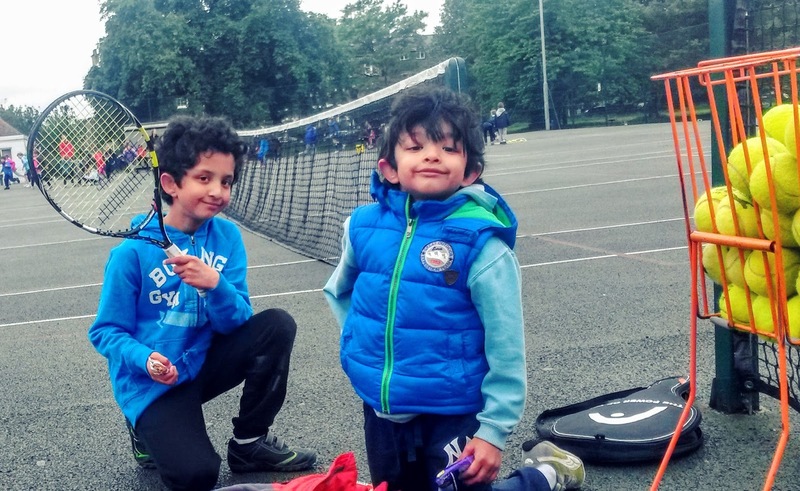 Their children whom LBT also coach, shown in photo below Kashmir and Simran. 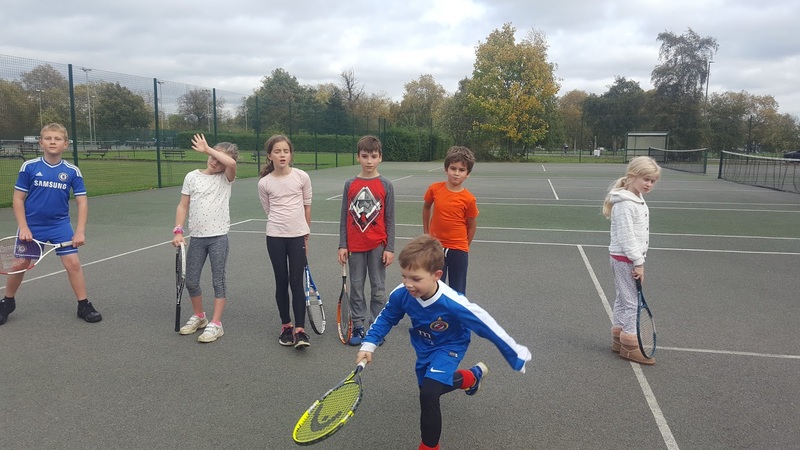 We think this is a genuine get-fit, get-sporty and fun-filled course of 5 or ideally 10 starter / improver tennis lessons tailored for the individual's ability and tennis enjoyment. Since LBT motto encompasses "Tennis Is Our Pleasure... Not A Business!" the Gift Card Scheme is affordably accessible to one and all. Scheme's success was validated when a block of three lessons was offered as a prize for Friends of Clapham Common Summer Party raffle (of whom Krishna is associated with as treasurer). Morning Only Camp (10am-12.30pm) costs £10 per session or £80 for 10. Full Day Camp (10am-3pm) costs £20 per session or £160 for 10. Additional hours from 8.30-10am or from 3-5pm are available at £8 per session. First Come First Serve: Minimum first 5 juniors to enroll for Summer Camp Programmes accepted to avoid over-crowding. 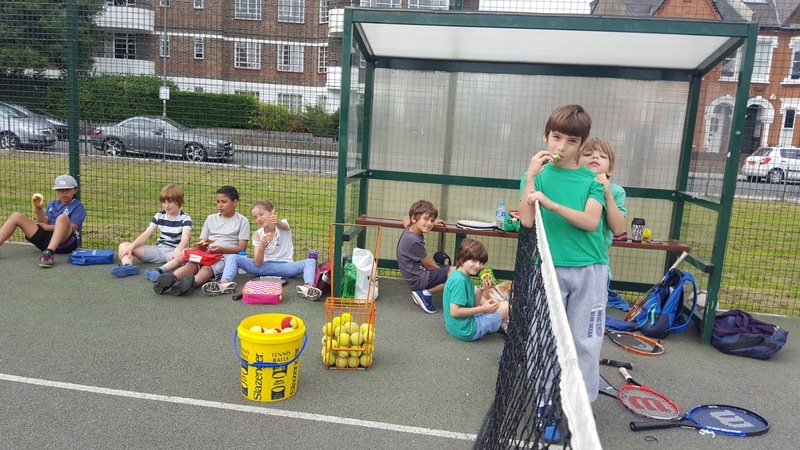 >LineBallTennis-Clapham Common Have Been In Hibernation With Regards To Updating Our "Local Tennis News" (see our Local Tennis News - Archive). 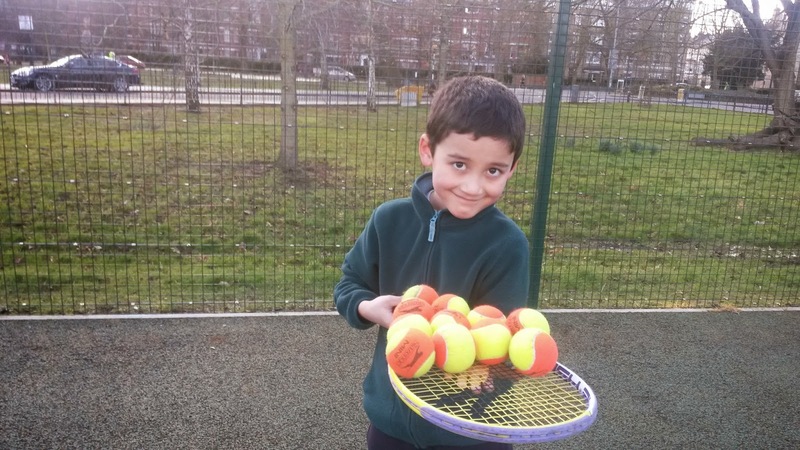 Yet, principle coach of LBT, Krishna has been actively busy on the Clapham Common tennis courts coaching, resuming after Christmas and Easter holidays. At time of writing, the second week of a rain-delayed #FrenchOpen is underway at Roland Garros, Paris. (KS 31-May-2016). 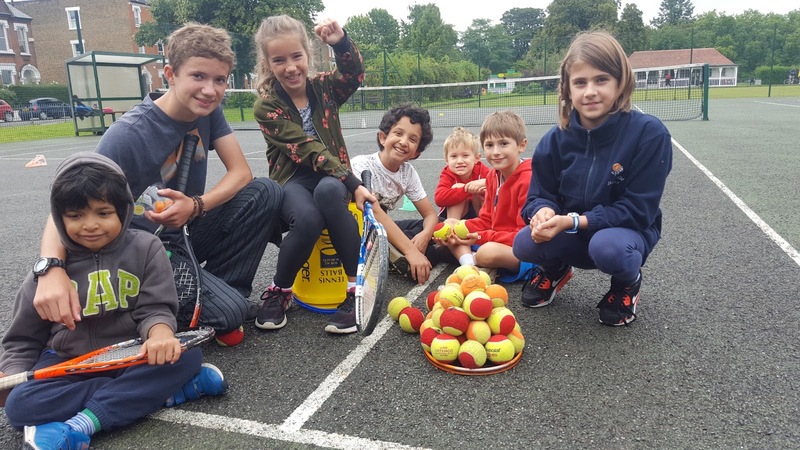 > Frequent and enquiring visitors to this LineBallTennis website will have noticed the Twitter messages from @LineBallTennis. These are an integral and complementary activity to enhance the lifestyle of tennis, in Krishna's craft. Tennis has an intellectual and elitist basis and origins. 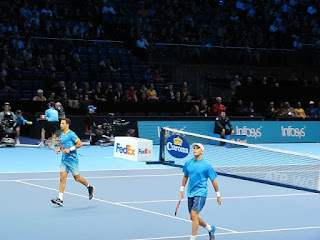 Kings and elite establishment figures originated the game of tennis which has filtered down to the folks. Don't take LBT's word for it, shown below is a Wikipedia extract. So in that vein, the LBT progenitor and purveyors believes in "social activism", especially with the advent of social media and the Internet medium. We would like YOUR Tweet rejoinder to the debate on climate change, #EUreferendum and other social-impacts; of course, indeed including tennis. > From the last Winter post of Local Tennis News, website visitors and weekend players at Clapham Common may know Paul. He and Krishna started developing a backhand drive and general training and practice in tennis, in the search for the Holy Grail of Backhands. He was noted in the end-of-year post as the most-improved adult tennis player of 2015. In early April while playing on artificial hard-court surface at Wigmore LTC he turned his ankle. Later he found he had fractured his ankle in two places, and consequently has been able train with LBT on sunday mornings. Paul's afternoon weekend playing partner Maurice is looking for stand-in players, and Krishna is matching time-convenience and playing-standards to make arrangements. Please call drop a line to LBT if your available after 2pm in the weekends. 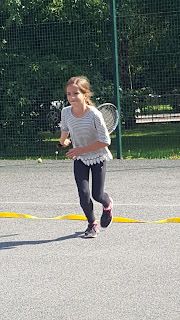 LineBallTennis - #ClaphamCommon Poster-Child "Kaia" Birthday in May. 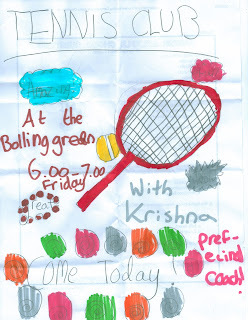 A seasonal message from Krishna of LineBallTennis to all his hard-working tennis improvers at the #Clapham Common public tennis courts. Most have worked with me to advance their tennis capabilities from years past, and towards continuing in the New Year. Also Seasonal wishes to the attendant "guys" in the club house / pavillion at Clpaham, the other coaches and staff at Lambeth Council. Ben & father Nico - Who Collected The Balls?! 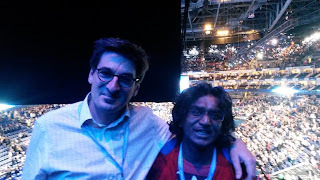 Krishna found less lavish hospitality, but nonetheless enjoyed a second consecutive visit on the 4th day Wednesday evening session at the O2 Arena. 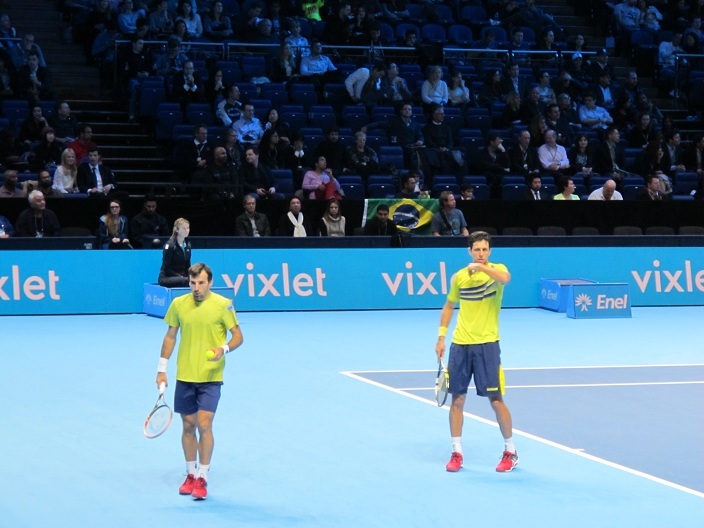 The end of season tennis finale lived up to its name, as a jittery doubles contest featuring Ivan Dodig and Marcelo Melo versus Jean-Julien Rojer and Horia Tecau (eventual semi-finalist & Championship doubles winners) was followed by David Ferrer versus Stan Wawrinka. 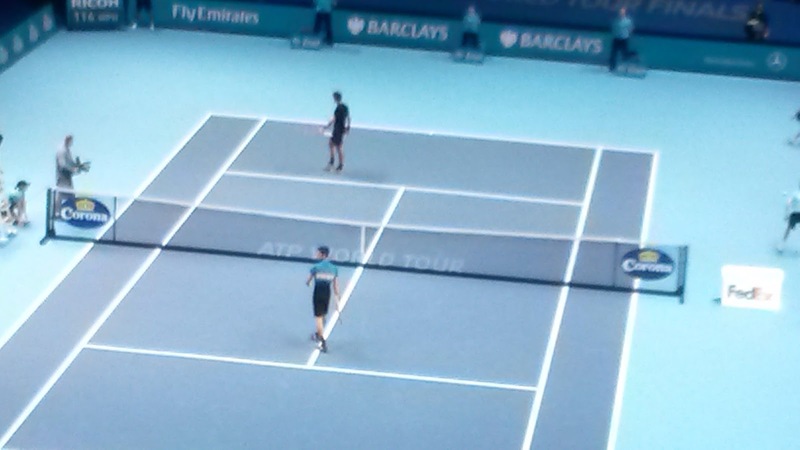 The latter being bigger badder player slogged through fighting fierce "El Torro" Ferrer 7-5 6-2. 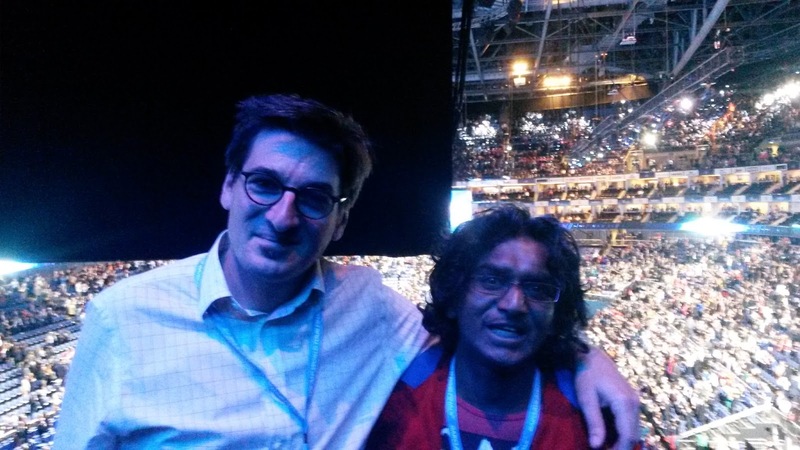 Krishna & Peter: "These things happen!" 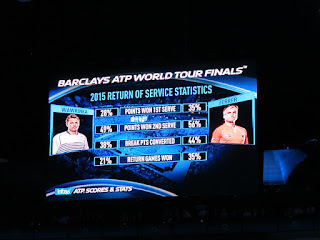 1st Set Serve Statistics Suggest Wawrinka Lost It?! 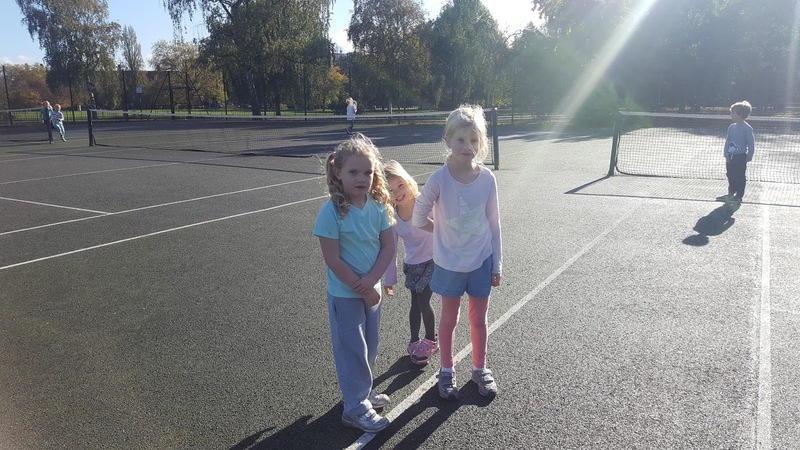 > LBT are seeking and posting testimonials from its clients and friends, about the Clapham Tennis services we are providing. To date we have received very kind commentary about our coaching and stringing service (see also here). 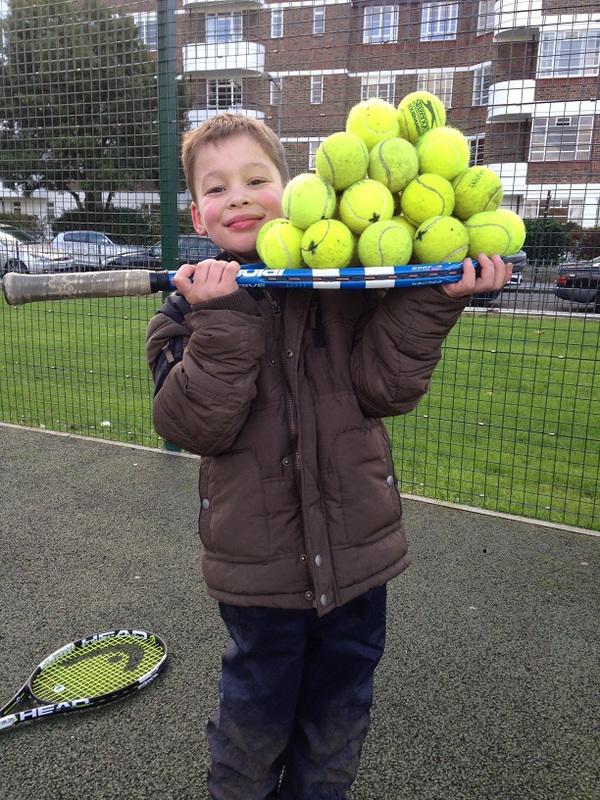 > SPECIAL OFFER: LineBallTennis are offering 5 lessons at 60 for groups of between 2 and 4 juniors. 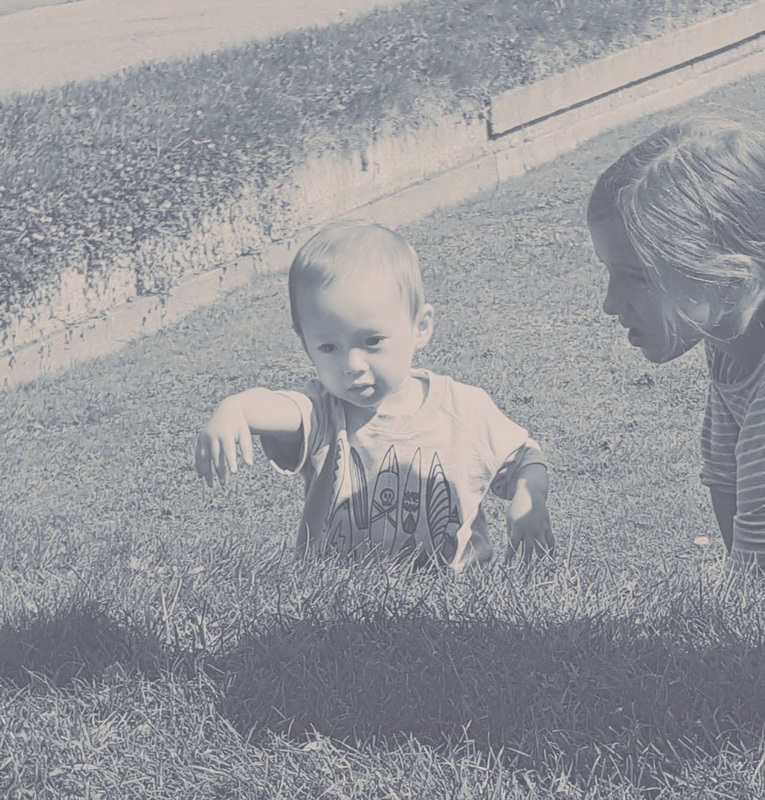 This offer is to capture the summer holiday children, who are remaining or visiting in Clapham Common and district. Pssst, please pass it on! 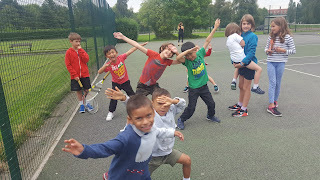 > On 12th July 2015, LineBallTennis and friends visited Wimbledon Centre Court for Men's Final Day (as pictured below posing near food village). 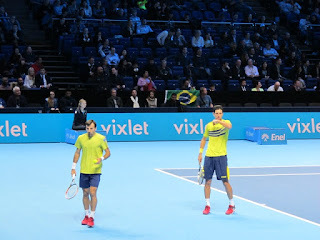 Also, read in our 'Latest Blog' what LineBallTennis's Krishna thought of the Djokovich-Federer Rivalry. >Prior to The Championship fortnight in SW19, LineBallTennis and local resident and Member of Grafton LTC Greg visited Wimbledon Qualifiers in Roehampton. 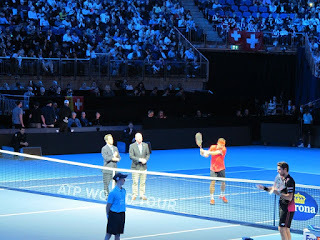 LBT's Krishna went 3 out of the 4 days to see the next tier of men and women tennis players i.e. those junior and adults unable to get automatic entry into the main Wimbledon draws. The lure of the well-kept-secret tournament aside, over the years of being a tennis groupie, Krishna identified and introduced himself to quality fringe tennis players: Dustin Brown (of Germany who recently beat Rafael Nadal at Wimbledon 2015), Ram Rajeev (of USA, age 3, defeated tall-standing 185h ranked John Isner in this year's grass court season at Newports, USA's ATP Hall of Fame Championships) Karolina Pliskova and twin sister Krystina Pliskova. Below are some faces and names that maybe more familiar to some tennis players. > Rip-off Britain: Rogue exploitative tennis coaching practices have been and are abound in Clapham Common public tennis courts, even nowadays under the auspices of Lambeth Council's Lambeth Tennis Network - LTN. To local residents new and old, and novitiate tennis players. LBT's long-standing local resident and tennis coach Krishna has a vested interest in promoting good practice (players per court, coaches per players & price per player etc), as advocated by UK tennis body Lawn Tennis Association - LTA, at least at its administered affiliate clubs. This is NOT an attack on any particular coach but a local public information service, and self-vested promotion of LBT tennis services. Q. 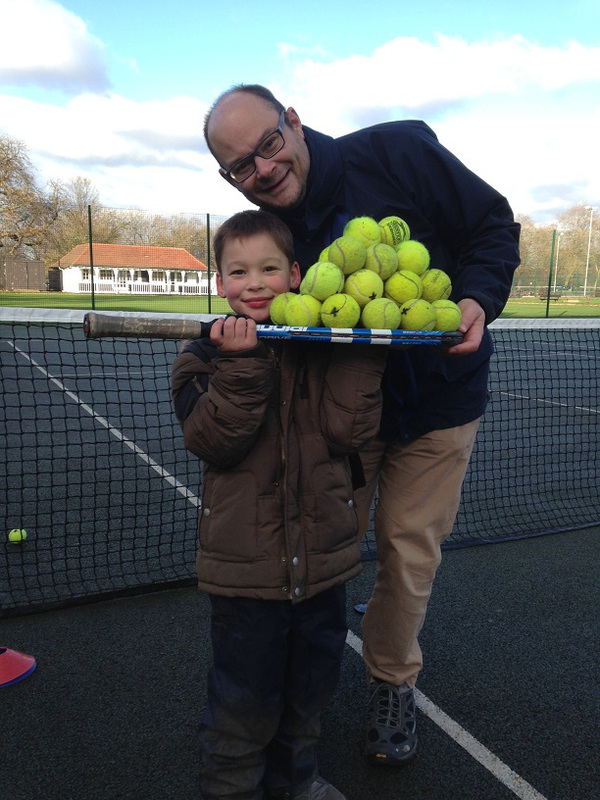 When does a novice tennis enthusiast not know what is good value tennis coaching? A. When they do not know that group-coaching of 6 players per court was £2 per session, which lasted one-and-half hour. 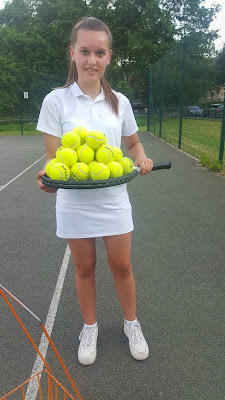 This information service seems pertinent as below picture depicts what LineBallTennis Krishna saw with one coach between two courts and over 12 players (on 22-July-15 at 7.45pm) at Clapham Common public tennis courts. Talk about fair class size, and state of British tennis is at stake. > Summer is just round the corner, officially Summer Equinox on June 21st. 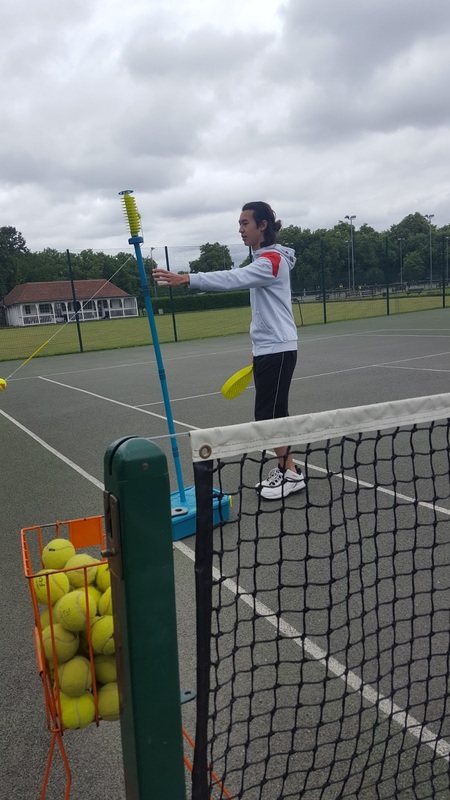 For LineBallTennis – LBT, our tennis service has been continuous at local Clapham Common public tennis courts. On 1st of May 2015, Friday we started our inaugural weekly Junior Drop-In Friday at 6pm. While inauguration was a Bank Holiday weekend and attendance low, LBT did host long-time local family, and their friend. 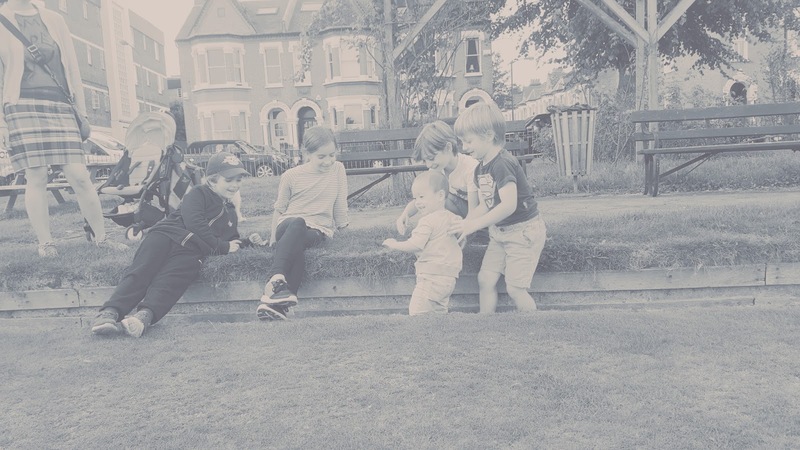 Brother aged 11 and sister aged 7, Harrison and Kaia (respectively in left frame picture, they are middle and right), with Leon from Tooting doing the guitarist / rocker smirk. 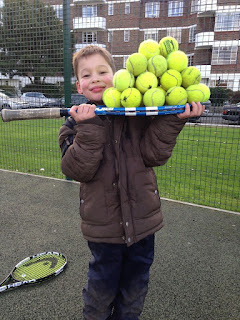 The Junior Drop-In Friday was also mentioned previously on www.facebook/lineballtennis. 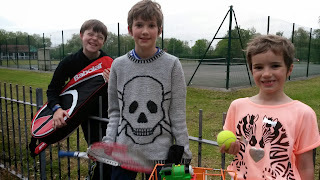 The following day Saturday, for usual “monkeying around” and serious tennis drills, following their football practice, Max and Tom (in right frame picture, middle and right respectively) and their friend "Billy of Bonneville" (far left on left pic). 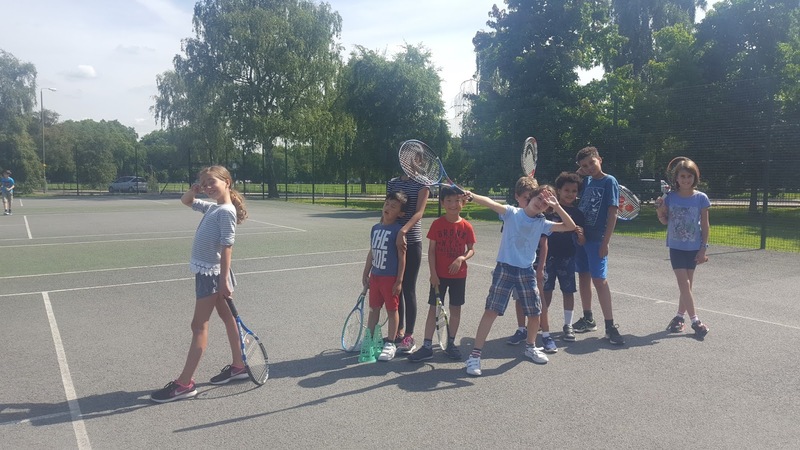 > Local Badminton Road resident and experienced junior tennis player Dylan aged 13, whom we mentioned in earlier blog - see here, narrowly missed out on being selected for ball-boy privileges at this year’s Wimbledon Championships in the summer. As protégé and friend of LineBallTennis we were disappointed we could not help further his trials / application. Yet we were more than encouraged with Dylan’s philosophical responsive attitude: “I’ll try again next year!”. LBT will aid and follow progress. 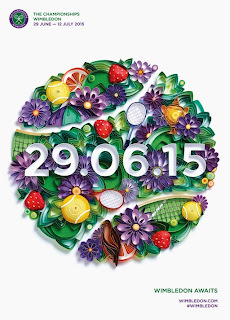 > LineBallTennis – LBT are accompanying our valued clients to The Wimbledon Championship Qualifying matches. This annual event is a little known pre-Wimbledon tennis tournament that happens locally near Roehampton. 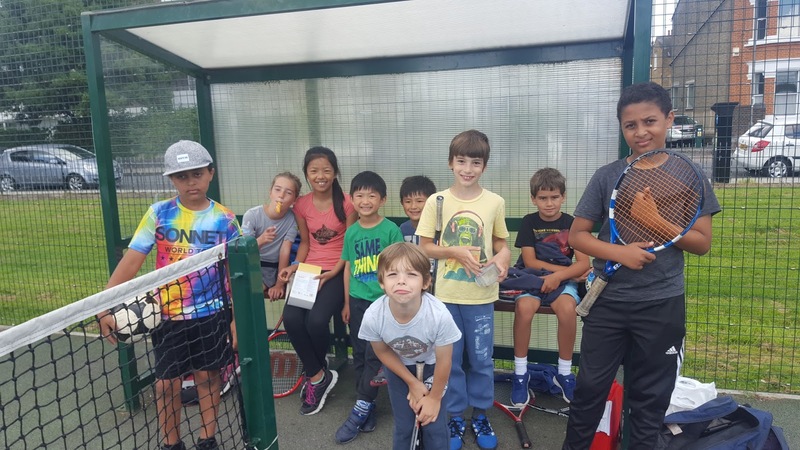 For more details on this ‘hush-hush’ event, and those wishing to attend with LBT’s coach Krishna please contact us at lineball@talktalk.net or message us via our FaceBook site www.facebook/lineballtennis (our mobile telephone line 07404 125073 is now obsolete). 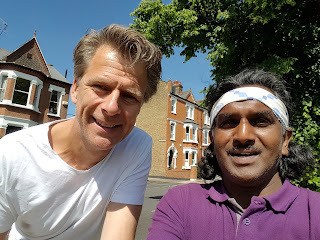 Last year at this Wimbledon Qualifying event LBT recognized, and was somewhat perplexed at seeing a familiar eccentric tennis player (see picture). Can anyone correctly identify this player in the picture with LBT’s Krishna? 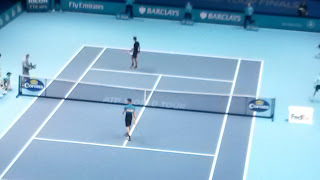 > Also, LineBallTennis – LBT is boastful of having tickets and going to The Wimbledon Championship Men’s Final Day at local SW19. 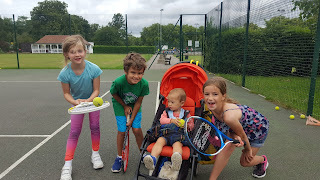 Of course I am not playing there then; though I’m going on the day, along with parent Andrew, and LBT-coached star Jack, who may still have a chance to play final’s day on the haloed turf of the Centre Court. Below is the official poster The Championships 2015 designed by Russian paper artis Yulai Brodskaya. At the heart of the design is the one week later start date of The Championships. Read more about it here. The historical traditional beginning of Wimbledon, one day after Summer Equinox, is perhaps significantly indicative of Climate Change! > And finally, a mention in LBT’s Local Tennis News for the 17th May, Nepal Benefit Fund-Raiser event organized by much-liked Sunil. 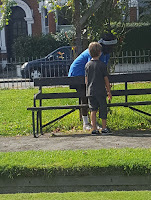 He is normally serving in the court booking huts, and increasingly playing tennis at Clapham Common courts. Sunil, who is descended from Nepal, organized a lively event with 5-piece band, raising money for the recent tragic earthquake that hit that country. 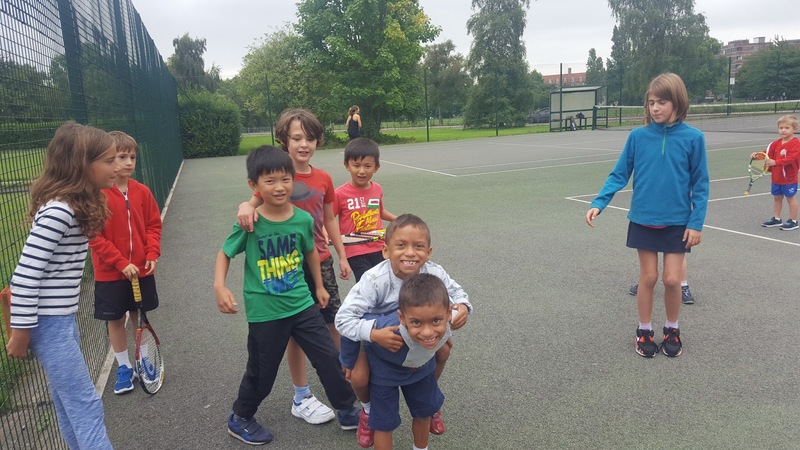 And I am sure for the famed courage of the Gurkhas, some local regulars at the public tennis courts turned-up to play social doubles tennis and sample Nepalese buffet cuisine. For those who are not familiar with the geography: the highest mountain in the world, the Himalayas are nearby, with many Nepalese having lost their lives acting as mountain-guides “Sherpas” to the venturing mountineers. Those local Clapham Common sympathizers, not able to attend the fund-raiser event may like to donate to directly to Sunil, to see money put to a worthy cause. 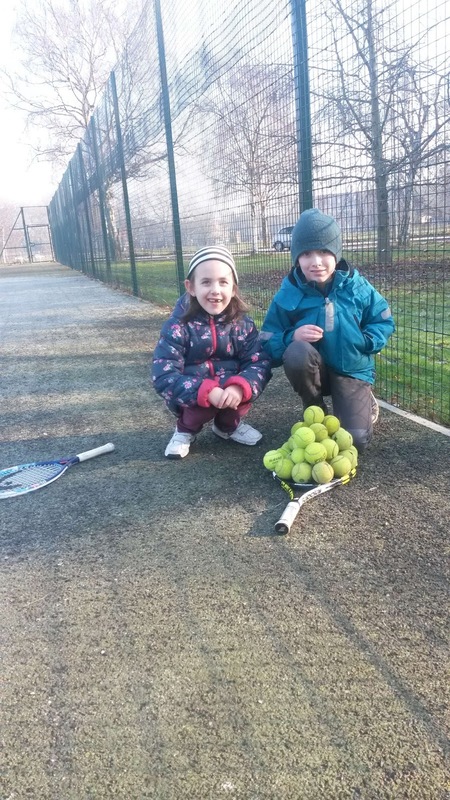 > LineBallTennis have NOT been in winter hibernation! We have been on the Clapham Common tennis courts in damp dreary cold weather, and also in glorious foretaste of Spring sunshine too. 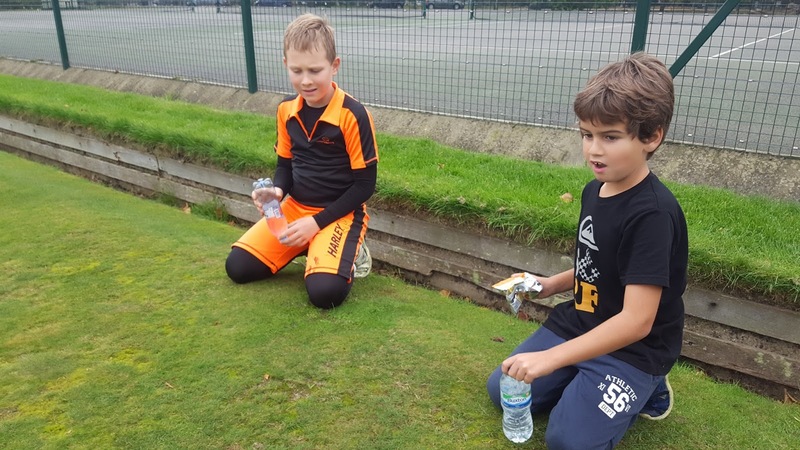 Thank you to the hard-core tennis practicing players for keeping LBT busy especially during weekends in the quiet seasonal period. You know who you are without the star name mentions - LBT gratitude. 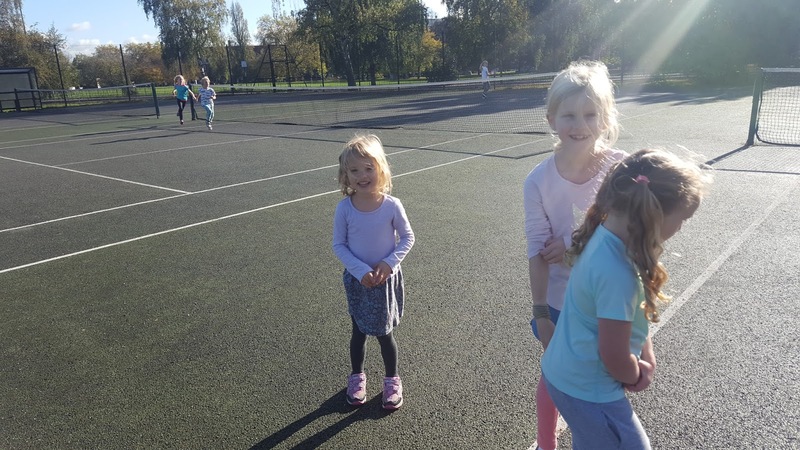 > After the recent mid-term school break the children are restarting their tennis with us. Here we give a special mention to the third member of the "Three Musketeers" Behruz. 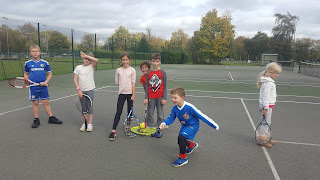 He is shown in the picture below performing a balancing-act to collect tennis balls on his racquet during 1st of March Sunday squad drills. 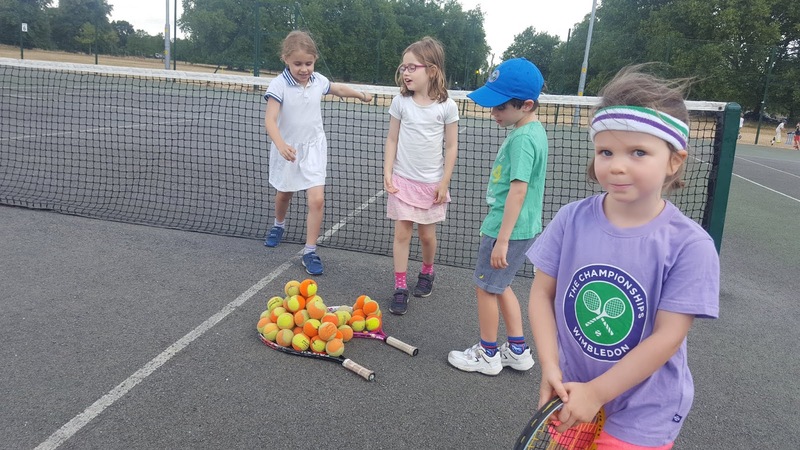 Behruz's is 7 years of age and joins his fellow musketeers, Hippolyte and Cyprien in LBT's Local Tennis News (see Local Tennis News - Archive) for his fuming outrage for Hippolyte having knocked the balls off his racquet earlier in the lesson. In the picture below, after his tantrum remonstrations, Behruz displays himself calm collected yet with telling mischievous smile. Behruz has also enhanced the "know-your-tennis-court" game by suggesting we not only race to the named place on the tennis court, but HOW we get there e.g. "By sidestepping etc, the first one to the net!" 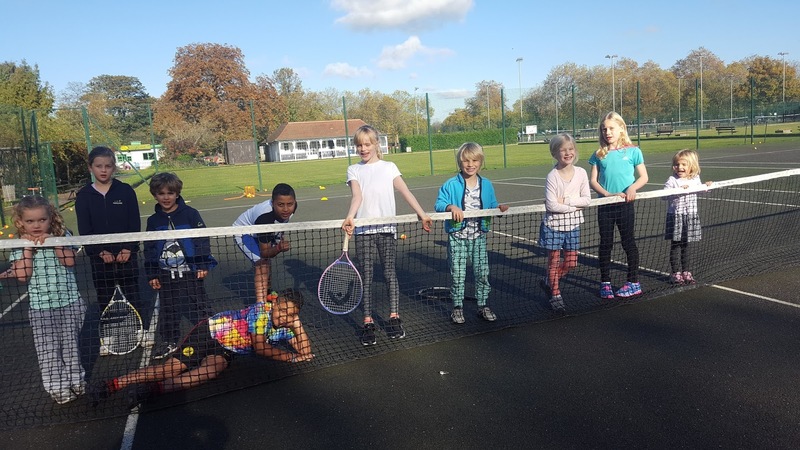 > Due to the fire at the Clapham Common Westside Bowling Green and Tennis clubhouse on 30th Oct'14 - read all about it in LBT blog, all telephone tennis court booking to be done through Ferndale Booking 0207 7738 6834 or through Better Online. The hut number 0207 223 9837 is out of use in the interim. 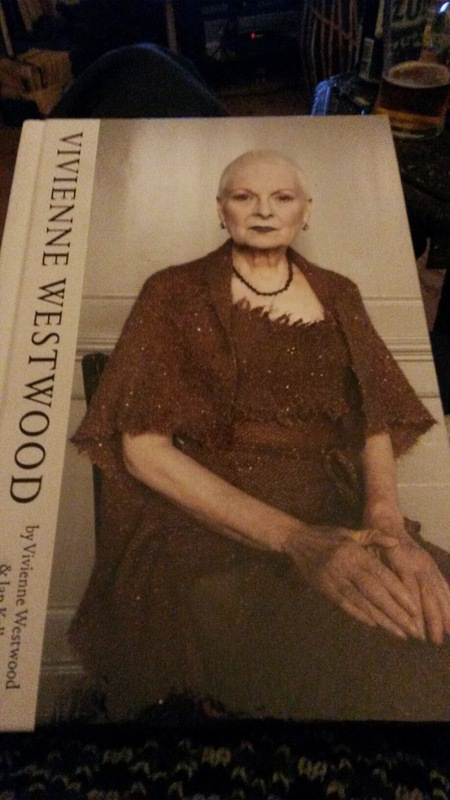 > Mid-Oct'14: In case you have NOT noticed the launch of Dame Vivienne Westwood's semi-autobiography in the last month (pictures below). 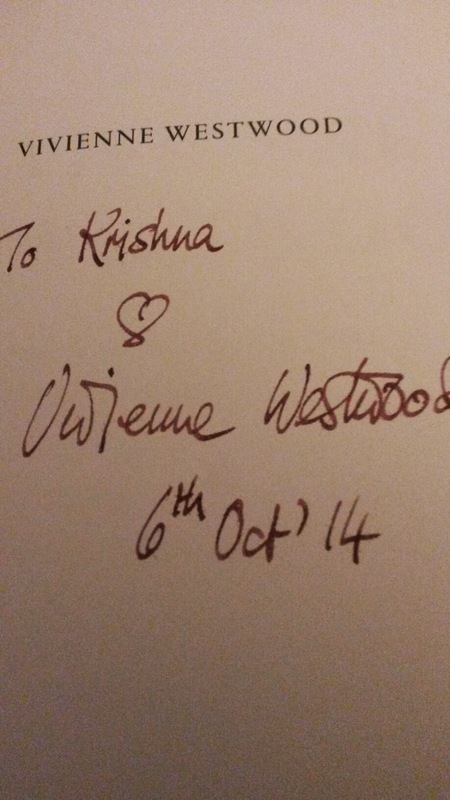 LineBallTennis's principal Krishna has known Dame Vivienne's family since he descended on these shores in 1977, the year of the Queens Silver Jubilee. LBT recommend the biography for local rock and fashion flavour of an era that went 'viral', having originated very near the Clapham Common Bowling Green Tennis Courts. 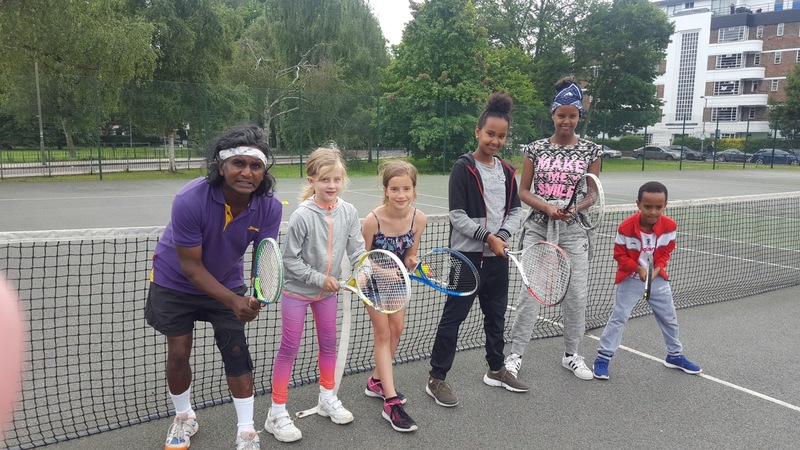 This is NOT merely a 'plug' for a good read or LBT's connection to a local fashion leader and Climate Revolution activist, the other newsworthiness to local tennis is that, LineBallTennis coached Andreas. He is the fashion designer 'hubby' of Dame Vivienne. 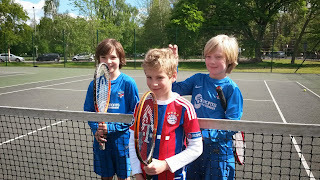 Early communication suggests Andreas is to resume LBT tennis lessons - having recovered from his shoulder injury. Achtung! > Clapham local residents and LBT junior stars Hippolyte and Cyprien of Bellville Primary School (the latter having moved schools recently), show-off creativity in the field of tennis ball pyramid in the picture below. Such charismatic junior reinforce LBT's moto "Tennis is Our Pleasure!". LBT principal Krishna is looking forward to resuming tennis training with them after they return from half-term break. > LBT are still forming a list of local tennis players, whom can be contacted for playing partners for tennis at Clapham Common Westside public tennis courts.To join the LIST simply submit in confidence your name, mobile number or email and indicating when you can be spotted playing. LBT need to watch briefly to assess player standard. Send details to LineBall@talktalk.net. > Local resident and experienced junior tennis player Dylan aged 13, is having trials this week at his school for appearance as ball boy at the Wimbledon Tennis Championships in 2015. The preliminary stage trials to select ball boys / girls for June / July 2015 at SW19 is taking place at participating schools for Year 9 - 11 class age groups. 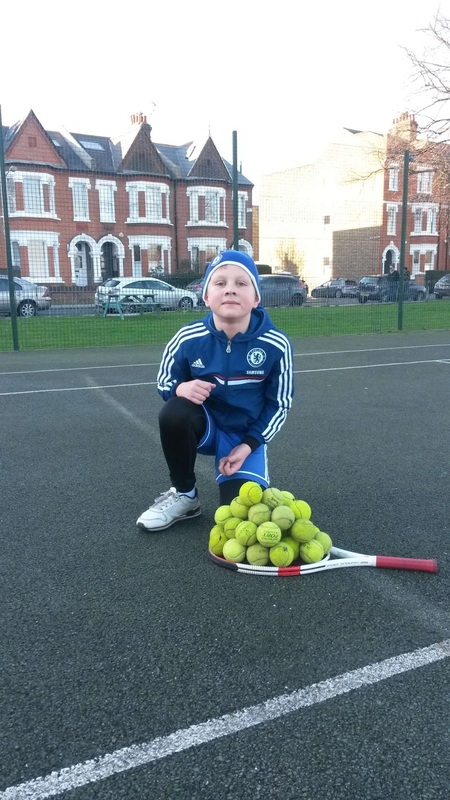 LineBallTennis - Clapham wish Dylan well, and will support and follow his progress. 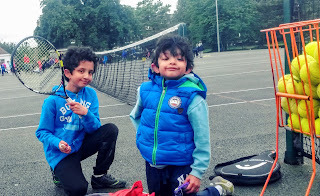 Other parents wishing to have chance for their youngster to participate in the greatest tennis tournament in the world should enquire with Lawn Tennis Association and the All England Lawn Tennis Club. 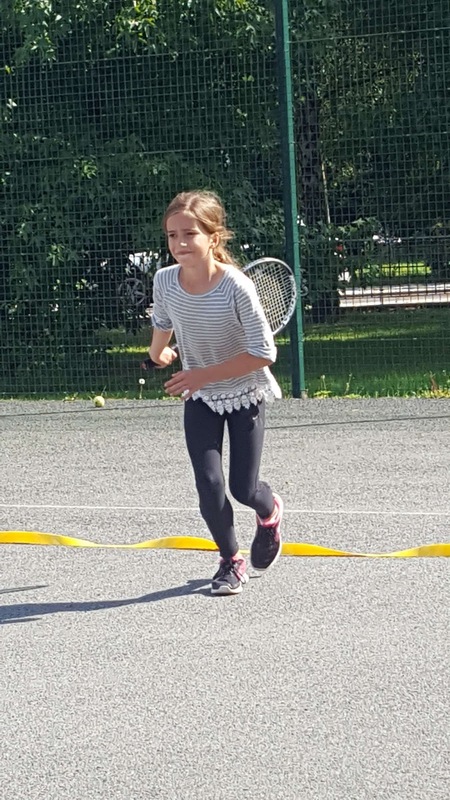 > From the kind parents and deeds of the parents of LBT's junior tennis client Cyprien, to publish LineBallTennis at Belleville Primary School, we now have new adult tennis client Gemma, who is school governor there. LBT consider this an additional endorsement to the numerous working professionals who have taken the plunge to learn tennis with LBT founder Krishna K. Siva. 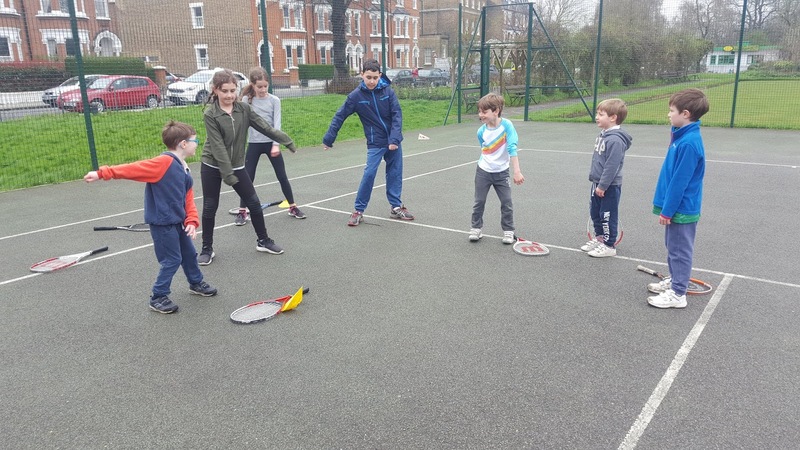 > Some Clapham Common public tennis courts users have suggested starting a list of local tennis players, whom can be contacted for playing partners. 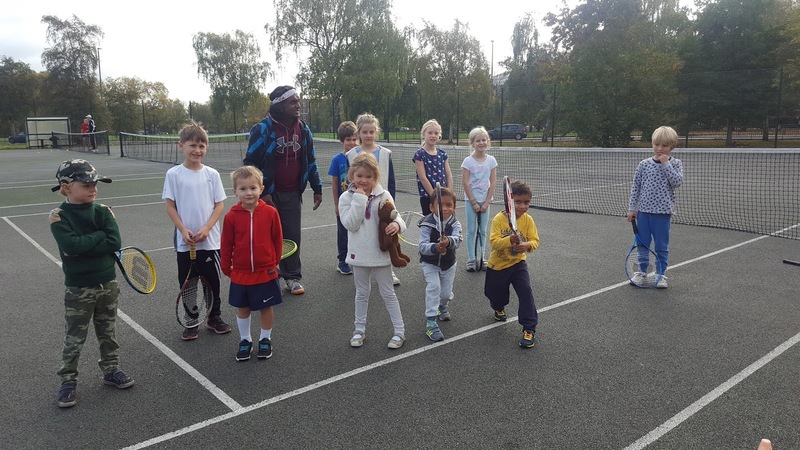 LBT encourages more court-time play to complement tennis lessons to all its clients. We are therefore starting a list of names of locals who would like player introduction. To join in simply submit to us your name, mobile number / email and when you can be spotted playing for LBT to watch briefly for player standard. For LBT's inaugural player introduction this week, we start with Albin and James. Bon Chance Monsieurs! I convey this not only as a competing coach at Clapham Common tennis courts and that I had taken a natural dislike to his Jekyl & Hyde personality; but relevantly to state that this outpouring about Mr Cousins’ erratic behaviour is one in a string of vitriolic criticisms proffered to me.